Gates Unicoil can maximize your hose sales and profits, while saving time for you and your customers. It's practically curved/molded hose! Available for 1/2-inch (12.7mm), 5/8-inch (16mm) and 3/4-inch (19mm) ID hoses. 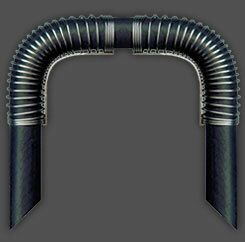 Gates Unicoil is made of a stainless steel coil and a metal spine that will permanently hold its bend on curved/molded. Available for 1/2-inch (12.7mm), 5/8-inch (16mm) and 3/4-inch (19mm) ID hoses. Gates Unicoil is made of a stainless steel coil and a metal spine that will permanently hold its bend on curved/molded. Gates Unicoil can maximize your hose sales and profits, while saving time for you and your customers. It's practically curved/molded hose!